Spice up your boring steak dinner by filling a fine cut of meat with spinach, mozzarella, and sun dried tomatoes. It's easy to tailor to your tastes, too! This is usually the part where I throw my hands up in the air and make a dessert instead. Today I found a happy medium between my steak-loving boyfriend and my desire to try out new and interesting recipes to share with you. 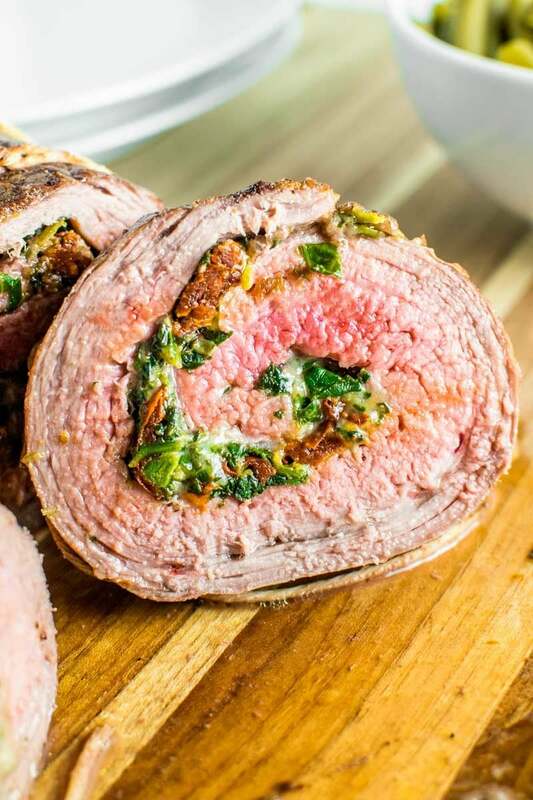 Enter stage left: Baked Stuffed Flank Steak! Now, don’t get me wrong: I love a good steak just as much as the next red blooded American (‘Merica!) But I’m also a fan of all things cheesy and flavorful. Easy is a big draw for me, too, and I’ll tell you right now I was really surprised how easy this recipe was to make. It looks far more complicated than it actually is. Just mix the ingredients, slather on a steak, wrap it up, bake it, and you’re done – time enjoy your super flavorful dinner! The hardest part to this whole recipe is probably butterflying the flank steak, but if you’re lucky, you just might be able to find a steak that’s already been butterflied (or have the butcher at the deli do it for you). The funny thing is that I had injured my knee the night before I planned to make this dish, so I sent The Husband to the grocery store with a very specific list of instructions so he could track down everything I needed to make his not-just-plain-steak steak dinner. And being the crafty guy that he is, he managed to not only find the already butterflied flank steak (prepackaged and already rolled in the “ready to cook” section) but also scored some free cooking twine from the deli to wrap the steaks with. I should send him to do my busy work more often. I was worried how the steak would cook through, but it was a perfect medium rare in the middle and a solid medium along the edges. However, I only broiled ours for about 5 minutes – broiling for 10 minutes would result in a more cooked steak. And don’t even get me started on the mozzarella, spinach, and sun-dried tomato stuffing – it was simply delicious. I think I could have made a big helping of it and eaten it just on its own. Okay fine, you know me too well; I did exactly that, but at least I had the decency to use a fork this time. Overall I was extremely happy with this dish, especially since I think it will likely become my go-to dinner for whenever we have company. It’s easy to assemble and cooks fast – how does that not please a crowd? Before attempting this recipe, make sure you have some cooking twine handy. Trust me on this, you’ll be amazed what you’ll use it for once you have some in your kitchen. For this recipe, you can either buy a steak and butterfly it (see this video for a tutorial) or you can check the deli counter. Sometimes they are selling flank steaks or steaks that have already been butterflied. You might even find a nice person behind the counter who will butterfly a steak for you. You never know until you ask! If you’d like to add a little more flavor to this flank steak, check the comments. Some readers have had some very tasty suggestions! 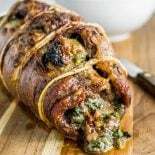 Spice up your boring steak dinner by filling a fine cut of meat with spinach, mozzarella, and sun-dried tomatoes. It's easy to tailor to your tastes, too! If you have not already done so, butterfly your steak by lining your knife up parallel with a cutting board and slicing through the center of the steak, stopping just short of cutting all the way through. This will make it so that you can open up the steak like sandwich bread, doubling the original length of the steak. Need a visual guide? Check out this video. Using a meat tenderizer, even out the thickness of the steak, aiming for 1/4 to 1/2 inch thick. In a large bowl, add egg yolk and lightly whisk with a fork. Add spinach and panko bread crumbs, mixing with the egg. Finish off by tossing in the mozzarella and sun-dried tomatoes until all ingredients are thoroughly mixed. Top butterflied steak with cheese stuffing, spreading it out evenly. Leave a 1 inch border along the edges of the steak clear of stuffing. Sprinkle top of stuffing with 1/4 teaspoon garlic salt and pepper to taste. Roll the steak along the "grain" (the ripples in the meat), starting with the smallest end first. Roll the steak tightly and tuck in any stray pieces. Using cooking twine (100% cotton string), snugly loop & tie the twine along the steak in 2 inch intervals. String should be snug enough to slightly compress meat but not so tight it begins to cut into the steak. Place stuffed & tied flank steak on a baking sheet of your choice (I used a 9x13 baking dish). Drizzle the steak with olive oil and use your fingers to thoroughly rub it into the meat. Sprinkle remaining 1/4 teaspoon garlic on top of the steak. Bake in the oven for 35 minutes, then set oven to broil and cook for another 5-10 minutes, to taste. Caution: Depending on how much juice the steak released while cooking, there may be a little smoke while broiling. 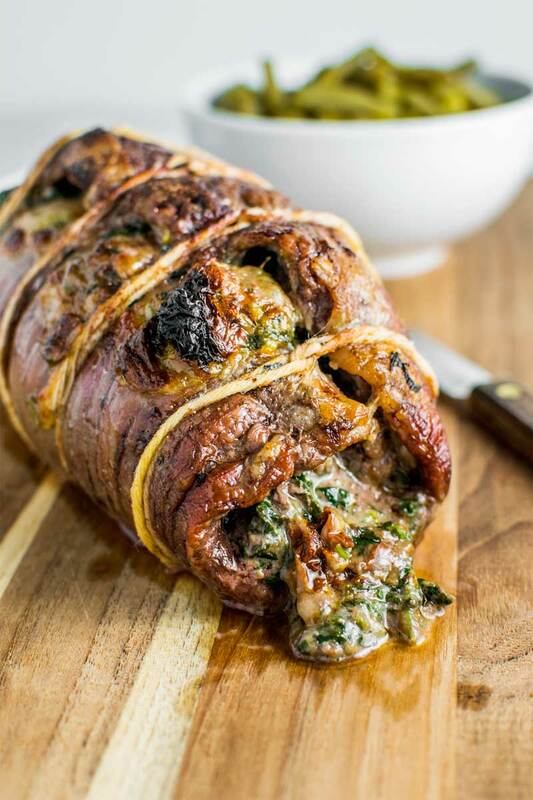 Remove stuffed flank from oven and let rest for 15 minutes, exposed to air and undisturbed, before serving. Hi, do you cover the dish with foil when cooking in the oven the first 35 minutes? I didn’t find anything in the recipe about the marinade. Hey Kris! This recipe actually doesn’t include a marinade. Can I use cream cheese instead? Looks delish! Do you think you can finish the steak on the grill instead of broiling to avoid the smoke? This was so good. The stuffing needs some salt and pepper. I would also put pepper in the outside but I like pepper. Thanks for the advice to ask the butcher to butterfly the meat. I think that is the hardest part of this dish. This is another genius recipe! The flavors, the aroma, the colors, well just everything about this dish is perfection. Perfect Father’s Day Dinner!!! YUM!!! Everyone loved it!! Definitely will be making this again, many times!!! This looks like a perfect date night meal – what else would you suggest serving alongside? This was Amazing!! I did a few tweaks to accommodate my family’s taste. No Panko or egg. I finely diced fresh garlic, added fresh spinach and fresh basil and used Gorgonzola cheese vs mozzarella. For the sundried tomatoes, I used the ones in the jar that is stored in olive oil. It gave the inside of the mixture just enough moisture! I really love trying new recipes. Easy to prepare and very versatile. I added precooked bacon pieces and onion. I did not put in the breadcrumbs. My husband likes his meat temperature to be medium and I like it more medium well. I left it on broiler for 10 minutes which was way too long. This was my fault so be sure to take it out at 5. Next time I try this I think I’ll put on the grill for the last 5 minutes. The meat was a little tough so I’m wondering if you should marinate the flank steak before you start. Made this tonight and it was delicious! For the stuffing, I chose to do spinach, onions, cheese, bread crumbs and bacon. The only thing I will do differently next time is adjust the cooking time. For 35 minutes at 425, the meat was solidly well done, even to the inside of the roll. I did not need to broil it. Excellent advice to let it sit for about 15 minutes. Helped with slicing for sure. Wow!! As I was stuffing the steak, I’ll admit I had my doubts. No idea why, but I had a hard time wrapping my head around steak stuffed with cheese. And it came out amazingly delicious! I’m so happy! I used sundried tomato-garlic paste, 4 cheese Italian mix, added chopped mushrooms and shallots to the mix, and didn’t broil. Thank you! I’m blown away! I made this exactly per the recipe and that was hard because I always adjust recipes, it was exceptional! So much so that I am making it again this weekend dinner party for 12. We like medium rare so watch your oven. Also, Publix and Piggly Wiggly will butterfly your flank steak, the rest is easy. Super easy dish to make! Had the butcher do the tough part! Delish as is, but think you could get creative with additions to stuffing. Thanks for sharing!